If you love your furry friends as much as we do, then read on. This is the ultimate packaging guide for the wild animal obsessed, the cat lovers, and the puppy parents. Check out a few of our animal-inspired packaging favorites and how we use them here. Little paws dotted along the length of a ribbon or the exterior of a bag are a treat for any animal lover. Whenever we want to add a finishing touch to our animal-themed gifts, homemade pet treats, or crafts, we use paw prints. There is nothing more fierce than a big, bold repeating animal print. When we want to make a statement with our gifts and packages, we tend to turn towards a fashionable zebra stripe, classic leopard spot, or modern fish scale. 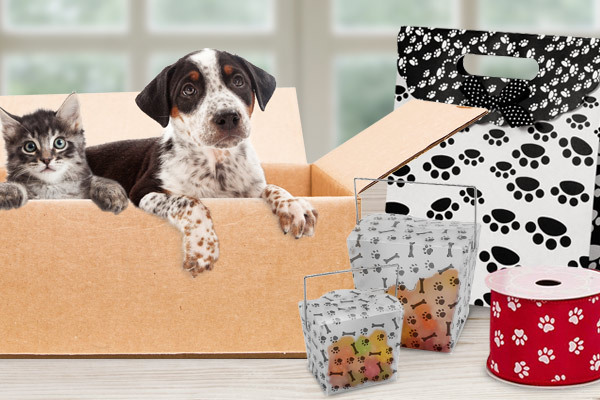 While details like patterns and paw prints can be fun and fashionable, nothing celebrates our furry-friends more than seeing their faces on our packaging. How do you celebrate your furry friends? Do you wrap up extravagant gift packages for them to tear up and enjoy? Or do you embellish smaller treats and toys for them to show you care? Show us using the social tag #mypapermart. If you loved these packaging favorites and want to see more, stay tuned. We’re looking forward to making more product features, tips for small businesses, and DIY craft videos!